Apart from the TIC100 and EDC campaigns, Advantech has also cooperated with famous college MBA professors and students, and selects an important management or research and development subject to promote EACC (Enterprise-Academy Cross-over Collaboration), and spread our positive concepts more widely into schools. 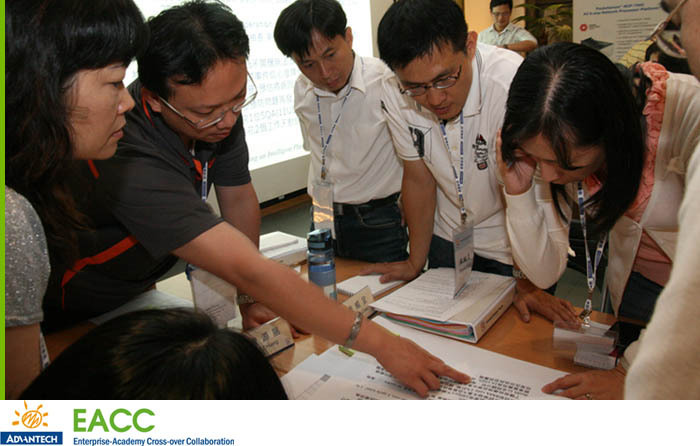 In EACC (Enterprise-Academy Cross-over Collaboration) Plan, Advantech senior managers will enter into schools to share their actual management experiences and facilitate professionals to lead students, and conduct thematic research into specific corporate issues, as well as discovering solutions problems outlined in case studies. EACC is able to generate individual undergraduate thesis' with high reference value, feasible corporate marketing development plans, and a complete learning methods that can feedback into society, which can be used for employee training and innovative teaching in schools. Through EACC, we expect to make businesses and schools bring benefits to the industry together and become a model of industrial/academic cooperation.